In the second of two articles on last week’s MarshLink Action Group (MLAG) public meeting, this week we look at the likelihood of High Speed One (HS1) coming to Rye, and the opposition that the idea has already generated. The MLAG meeting heard three linked presentations. The first by Richard Williams, MLAG Committee member, who fed back the results of their recent survey of travelling public on the Marshlink link line; the second from Roger Blake, director of Railfuture; and the final speaker was Keith Glazier, leader of ESCC but speaking in the capacity of Chairman of Transport for the South East, a sub-national transport board covering 16 local authorities along the south coast that cover all forms of transport. Upgrading the train infrastructure featured highly in their presentations. Both Roger Blake and Keith Glazier spoke of the enabling work that would need to take place prior to the HS1 ever coming to Rye. Some of the work, such as opening up an additional platform at Ashford for HS1 services, is hoped to be completed by the end of 2020. This would allow a cross platform interchange from the Marshlink train on platform 1 and HS1 services on platform 2. Roger Blake outlined the immense work that would need to be undertaken on the Marshlink line to get it ready for HS1 services – from strengthening the rail embankments to closing most of the unmanned pedestrian crossings along the line. This enabling work alone would reduce the travel time to Ashford from Rye by 7 minutes – or in other words by around 30%. If you add this to a cross platform interchange to HS1 at Ashford, a commute from Rye to London would be made much easier even without HS1. And this is key to the debate about extending the HS1 service to Rye. Michael Boyd, Mayor of Rye, spoke with passion on behalf of those who are opposed to the introduction of the HS1 service to Rye because he believed it would turn Rye into a commuter satellite to London. A number of people in the audience agreed with the Mayor’s opinion but for those travelling on the Marshlink service, and who responded to their recent survey, there was overwhelming support. 71% supported the idea of a HS1 service to Rye with only 4% not supporting (25% listed no preference). The survey was carried out over a period of two weeks, at different times of the day and received over 450 responses. 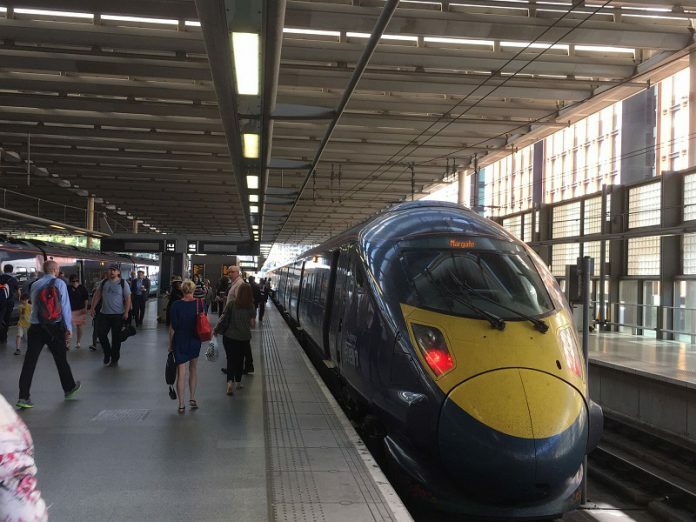 Local MP Amber Rudd has backed the HS1 extension to Rye, Hastings and Bexhill and an attendee at the MLAG meeting raised the possibility of the HS1 service running through Rye without stopping. It would be interesting to hear what Rye News readers thought of that idea. It’s impossible to know if HS1 will ultimately come to Rye but what came out of the MLAG meeting is that it’s a long way off and an awful lot of work needs to take place on the Marshlink line before it can even be considered. That’s not to say it won’t happen but that a strong case has to be built and local concerns addressed. If the extension happens, it would be lunacy not to have it stop in Rye. The result would be reliance on slow trains interleaved between the fast service, cancelled as and when to allow the HS1 priority – I suggest an even worse service than the current Marshlink. As for a concern that Rye would be come a commuter town, what is it now? A tourist town – too many shops now selling coffee or rubbish not needed by the average resident, and a supermarket that doesn’t pass muster for a decent weekly shop. A few families moving to Rye, with one person or even both commuting can only bring expenditure to the town. “Oh but the house prices” goes up the cry – well perhaps better to have houses lived in 7 days a week than the large number of second homes or, worse, empty properties advertised for holiday or short term rent on AirBnB and similar. I suggest that the attraction of the HS1 is not actually any saving in time, it is the convenience of bring able to make the journey on one train. I would quite happily spend exactly the same number of minutes from Rye to St. Pancras on one train, as train one/change and wait at Ashford/train two. If the service was reliable. Meanwhile, perhaps the Mayor, if opposed as this article suggests, can tell us all what other plans he has for inward investment in Rye. I fear the arrival of HS1 is nothing more than a pipe dream. Already Southeastern trains claim HS1 is a victim of its own success and there are no spare units to increase services. As someone who has to travel to London regularly and frequently to connect with a long distance service from Kings Cross, I would much rather have a reliable service to Ashford, perhaps with a different type of diesel train, sooner rather than later and be certain of getting where I need to go at the time I expect, than to be living in hope of a very unlikely possibility in the future. At present, there are no spare trains within 70 miles of Rye because it appears there are no qualified engineers at Eastbourne or Hastings so that when one train breaks down, there is no replacement and a gap of two hours between services. Meanwhile, the wonderful staff at Rye face abuse from those affected and the team of Southern ‘delay repay’ customer services deny legitimate claims. They say that politics is the ‘art of the possible’ perhaps Southern might like to consider what they can do to make the current promises of services possible now rather than some unknown point in the future? Rather than H1 to Rye, which seems completely unnecessary since it only decreases travel time by 7 minutes, another solution would be to extend the current track system to a double line so additional trains can run. Having mostly a single track line from Ashford to Hastings is outdated. A double track would allow additional trains to run. One major problem with the H1 is that all unmanned crossings, including footpaths, would have to be closed. This would effect Rye significantly with two well used footpaths now crossing the tracks. Further along there are other footpaths that cross the tracks toward both Ashford and Hastings that would need to be closed. And there is the cost to consider. H1 from Rye to London is now at £76 return at rush hour, is one of the most expensive train rides in Europe. Even non peak costs are exorbitant. If we have planned rail replacement buses then the departure times should be displayed on the CIS (Customer Information System) screens – this included the yellow screens on the platform and the screen inside the ticket office. Even if the ticket office is closed this screen should be visible through the window. The other way to find out is to press the blue Information button on the white help points that are on the platform and the operator will be able to tell you the next schedule bus time. Although we do our best to ensure the ticket office is open for all the hours it should be, unfortunately last weekend the member of staff due to be working was unwell and we did not have any alternative cover. I have checked our cover statistics for the last six months and the ticket office has been open for over 90% of the scheduled hours.